A gallery wall is a wall hung with lots of pictures or items – often called a ‘salon style hang’ named after the annual exhibition held by the École des Beaux-Arts in Paris. 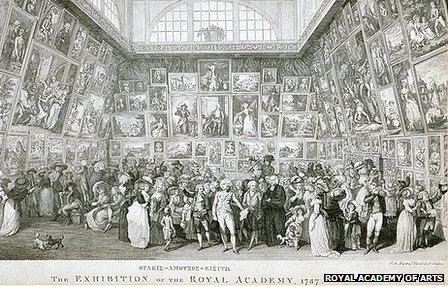 The most famous salon style hanging in London nowadays is The Summer Exhibition at the Royal Academy of Arts. So how do you hang a gallery wall at home? For me, the best walls are the ones that are the least contrived. We’ve all seen the immaculate photo walls where people hang photos from the same one shoot, in the same frames. I find these walls leave me a bit cold and they also date quickly. Kids grow up fast and you soon find yourself with a load of photos from a very small and increasingly out of date period in your life. Better to select photos from a wide range of life stages – situations, people, places and things. These kinds of walls feel far more personal, more eclectic and are easier to update. You can either just add the odd new photo or piece to the edges and allow the wall to grow organically, or you can swap in and out as you get things you love more. The biggest mistake I see my clients make is not hanging close enough. Look back at the photos of the salon hang. 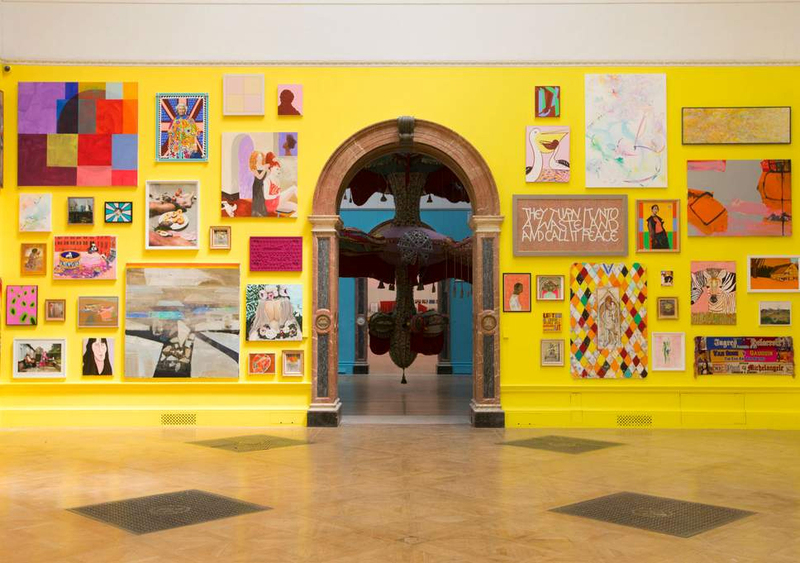 The one from 1787 is probably too tight, but the 2018 Royal Academy Summer Exhibition is lovely and close. Hanging tight allows the eye to read the wall as one space. I find it easier to keep a sense of cohesion if one thing is the same. For example, you hang a collection of landscapes – they are all in different frames, but they are all the same theme. Or you hang a mix of works – some photos, some collages, some oils but they are all in the same colour frame. My gallery wall at home is an eclectic collection of works, but it’s held together by all the frames being black. Hanging a gallery wall should be a fun creative experience. Mark out your wall space on the floor first and then just have a play. Experiment with works creating a rectangle as a hard edge or with a looser edge. Remember nothing is set in stone until you hang it and even then things can be changed or added. Despite suggesting you keep one thing the same, here we purposefully kept ‘Granny’ in her white frame so she would remain special. 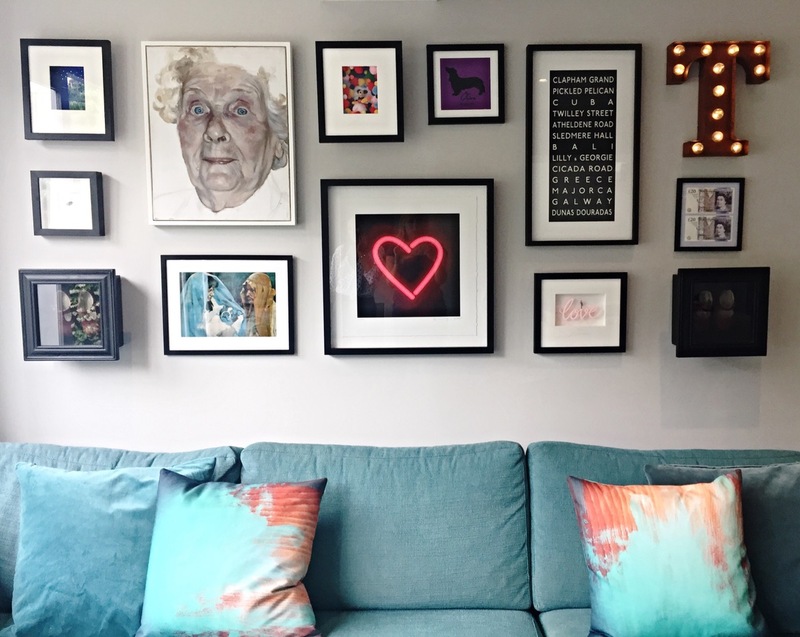 Hopefully this has inspired you to get cracking with your own gallery wall, but if you think you need some help or just someone to do it with, then do give me a call on 07855 803509. I charge £150 for a two-hour consultation which is enough time for one or two walls depending on the scale of the project.